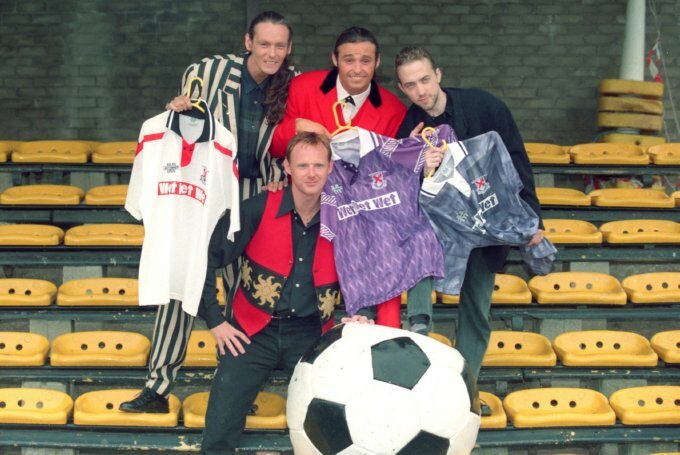 Love was all around for Scottish side Clydebank in the mid-nineties, as their nation’s finest purveyors of cheesy pop Wet Wet Wet decided to pump in substantial funds to the club in return for having their incredibly unmanly logo featured on the front of the side’s jersey. Back in England, in 1985 West Brom briefly deemed it a good idea to promote new anti-smoking rules at the Hawthorns by featuring an image representing the ban on the front of their strip. Hardly the trendiest of marketing ploys, it was gone by 1986. A little bit further afield, financially-troubled Greek side Voukefala last year agreed a deal with Soula, a local brothel. Unfortunately for the club’s players hoping for some interesting bonuses, it was quickly confirmed that the deal was made for ‘strictly economical’ purposes. The history of the Premier League alone is packed full of dramatic examples which prove just how calamitously big money sponsorship moves can fall flat on their face. Before their current agreement with AON, Manchester United’s lucrative shirt deal with risk management firm AIG was quietly dismantled after the company suffered gigantically embarrassing losses during the global financial crisis. Elsewhere, a Newcastle United played with the name of government-bailed bank Northern Rock on their shirts during their doomed relegation season, whilst West Ham were forced to use makeshift number-patches over their strip’s XL logo after the holiday package firm went bust mid-season. United seem to be on a one-club mission to bring every single company in the world on board as official partners of the club. Since 2004, for instance, they have had sponsored dugout seats, sponsored first by Audi and now Chevrolet, whilst in 2010 the club agreed a £40 million, four year deal with DHL for their training kit. Their vast array of current sponsors features an ‘Official Noodles partner’ and an ‘Official Telecommunications and Broadcast Partner for Azerbaijan’. 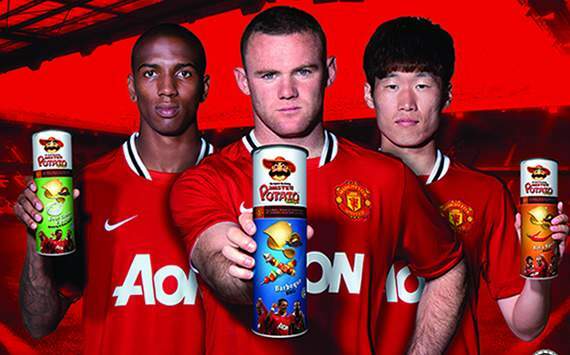 Perhaps the finest is their ‘Official Savoury Snack Partner’ Mister Potato, which “with a history of success and not compromising on quality…shares Manchester United’s commitment to excellence”. Great. Proclaimed to help the side “become one of the most technologically advanced clubs in the world,” FC Barcelona’s latest deal with Intel, which involves the computing firm’s logo being featured on the inside of the club’s strip in preparation for those shirt-over-the-head goal celebrations, is about as far flung from the club’s Unicef days as it is possible to get. Neither should Barca take credit for the idea: instead, the honour goes to another Spanish side, Getafe, who featured the face of the Burger King on the inside of their shirt when the fast food giant was their main sponsor. 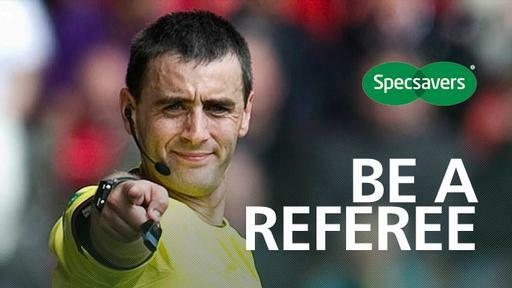 The Most Hilariously Ironic Sponsorship Award must surely go to the Scottish Football Association, who for years has caused sniggering across the footballing world with their arrangement to feature the Specsavers logo on the front of their referees’ strips. The company apparently arrange training, development and arrange vision and hearing examinations for the refs in question, but the deal’s comic quality surely outweighs any benefits it may bring. Robbie Earle lost his £150,000 a year contract with ITV after giving away his tickets for a fixture between the Netherlands and Denmark during the 2010 World Cup. The tickets were in turn sold to Bavaria Brewery, which then launched a guerrilla marketing campaign at the game involving a multitude of blonde girls clad in the company’s orange colours. At the same tournament, bookmakers Paddy Power got into trouble with FIFA after Nicklas Bendtner revealed a pair of branded underpants after scoring against Sweden. Likely to have been seen live by around 100 million people, the free publicity and endless fuss will have done the company no harm at all. Piers is a Manchester United fan who writes regularly for Dream Team Fantasy Football. Follow him on Twitter @piersbarber18. 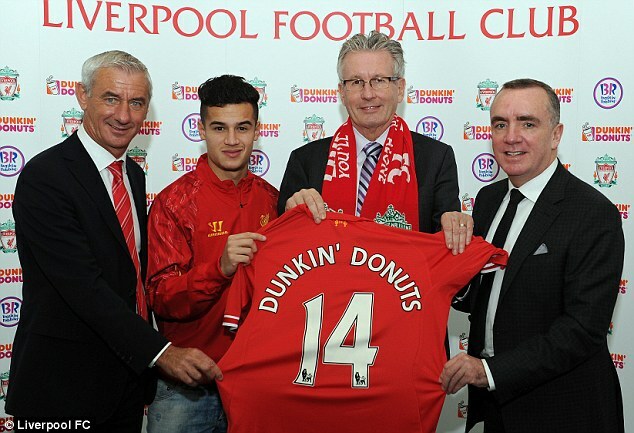 This entry was posted in Humour and tagged dunkin donuts, liverpool, manchester united, newcastle, northern rock, paddy power, west ham, wet wet wet, XL by Piers Barber. Bookmark the permalink.